Mr. Fred T. Johnson - In 1943, Mr. Johnson was in his third year of Pre Med at Indiana University in Bloomington, Indiana, when he decided that he wanted to defend his country by volunteering for the Army Air Corps. After Fred proved his capabilities in basic training at Greensboro, North Carolina, he signed up for training with the “Tuskegee Airmen”. Following two months of cadet training at Keesler Field, Mississippi, he was sent to Tuskegee Army Airfield for pilot training. However, during this time, the Army needed more bomber crews, navigators, and bombardiers, so he was sent to Tyndall Army Air Field in Florida where he graduated from aerial gunnery school. Squadron at Godman AAFB, Kentucky. He was Delaware’s first and only black navigator at the time. department until he retired in 1981. 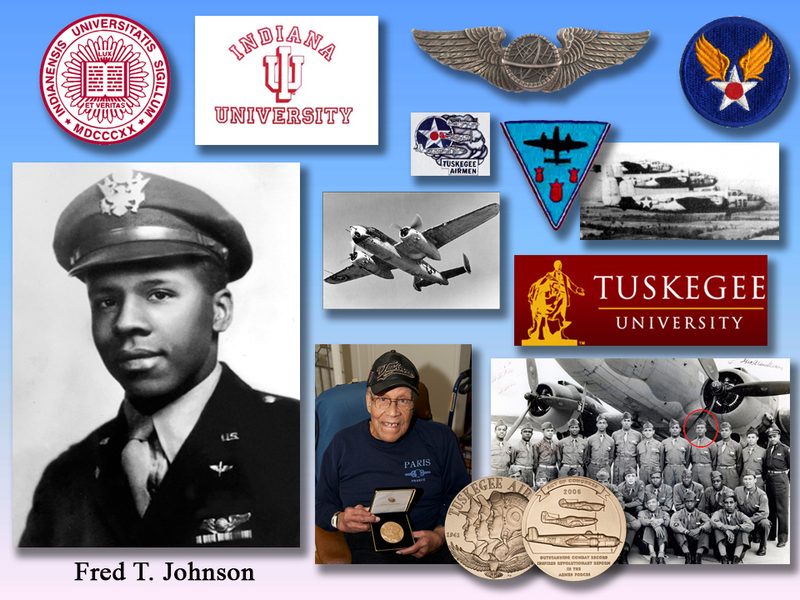 Through a belated documentation search, Mr. Johnson was finally recognized In March of 2013 as an official Tuskegee Airman and was awarded the Congressional Medal of Honor at his old high school (a school where his father, the son of a slave, was principal for 35 years).